By July, the gangly chick's black wingtip flight feathers start to appear. Crane chicks usually fledge, or have the feathers necessary for flight, when they are about three months old. Crane feathers get lots of wear and tear. Soon after their chicks hatch, the parents also begin growing a new set of feathers. Once a year the adults shed their old feathers as strong, sturdy new ones grow in to replace them. The breeding season is the right time for adults to molt because the parents must stay close to their chicks until they can fly. 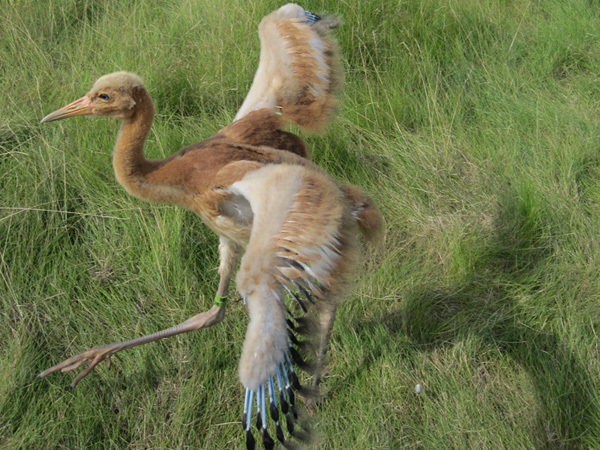 Once able to fly, the young can better escape from predators. After their molt is complete, the adults are safer too. By fall, all the cranes will have sturdy flight feathers to withstand the long journey south.